In everyday life, it’s very difficult to come across people using introverted intuition in an obvious way. While many people mistype as INJs, most of them are actually ISJs who thrive on proven facts and personal experience over flashes of insight and symbolism. Intuition is a very mysterious function and many times when INJs (or ENJs) use it in real life they are met with confusion or resistance from a largely sensing culture. As a result, many intuitives have to rely on their less-preferred functions to try to explain themselves to the outer world. INJs find that they have to rely on either Te (extraverted thinking) or Fe (extraverted feeling) in the outer world, and many wind up relying on inferior sensing to try to navigate a world that is tailored much more to sensing types. But what is introverted intuition? Introverted intuition is a perceiving (information-gathering) function. Carl Jung called the perceiving functions “irrational” and that’s because they aren’t decision-making functions. Introverted intuitives focus on the subjective, internal world of the unconscious to find abstract and symbolic connections and relationships between the unconscious and the environment. Ni-users see intrinsic patterns and connections everywhere and examine them internally to find their significance. They know how to shift perspectives to see things from many different angles and points of view simultaneously. Gary Hartzler, one of the founding board of directors for The Association for Psychological Type said of Introverted Intuition “It is first and foremost an awareness of abstract ideas, images, and/or conceptualizations….It focuses our energy on visions and images of the future.” He also states that Ni-users see ideas simultaneously from many different perspectives. This may be why typologists like Antonia Dodge and Joel Mark Witt from Personality Hacker call Introverted Intuition “Perspectives”. Because intuition is your dominant function if you’re an INJ, you might think you don’t even need to try to develop it, that it will just come naturally. While intuition will naturally play a dominant role in your personality, if it’s stifled or repressed it can develop in an unhealthy, inaccurate, or imbalanced way. 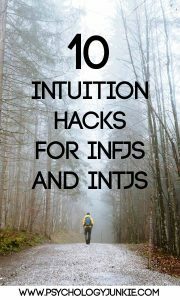 Even INJs (like myself) can have incorrect and unhealthy intuition, so it’s important for us to take the time to really try to gain a deeper understanding of it and develop it in a healthy way. Because the vast majority of people who type as INJs are actually not INJs, most of these intuition hacks will seem a little “woo woo” to them. If you don’t relate to these ideas or think they’re just too “out there” and crazy, then you might want to consider the possibility that you relate better to a different type (which is okay! those other types are amazing too!). Find a time every day that you can isolate yourself from outer stimulation. Introverted intuition works best when one draws into oneself and isn’t affected by the external world. Turn off the lights and any music you might have. Let your mind wander without any real purpose or direction and just allow yourself to daydream. Write down any thoughts, symbols, or images that come to mind. What would your life be like without constraints, rules, or limits? Write down your thoughts. Think of a person that’s important to you. Imagine the different ways a variety of people see that person. Try seeing their perceptions yourself and glimpsing their point of view. You can practice this same exercise with a movie, a book, or an activity that you enjoy or dislike. Practice shifting perspectives to see how other people feel about the same thing. On a day when you don’t have a lot of plans, just get in your car and drive without having a destination or itinerary. Practice just going wherever your intuition tells you to go. Ask yourself where you should stop, turn, and just let it be an adventure that could lead anywhere! Imagine your life 5, 10, or 20 years into the future. What images come to mind? What do you see for yourself? Draw a picture or write down what your vision contains. Go to an art museum, listen to a song, read a book, or watch a movie. Afterwards think about the meaning of the song, artwork, or movie. Is there anything symbolic that stood out to you? Were there any hidden meanings or metaphors that were significant? Your spouse is telling you a story. Your child is telling you a story. Your boss is speaking to you. Listen and try to understand the motives and core desires of the person telling the story. What is he or she hoping to attain? Are there any hidden motives? Introverted intuition is intrinsically tied to the unconscious. As a result, many Ni-users have very vivid, symbolic dreams. After you’ve had a dream try to write it down or draw a picture of it. Try to remember everything as clearly as possible. Is there any symbolism in your dream? Could it have any hidden meaning? Is there a goal you’re currently aiming for? Envision reaching that goal and then work backwards to see what steps you took to get there. Is there a way you could reach that goal more quickly? Any time you have an idea or sudden image that pops into your head, write it down or draw it. Is there any symbolic connection to that idea and your unconscious? Is the image meaningful in any way? Can you make this idea a reality? If it’s a negative image, what do you think you might learn from it? Do you have any intuition hacks to share? Let us know in the comments! This is cool. I have learned over time to do most of these things. There are a couple I haven’t tried. As I’ve grown up I’ve grown more into myself by practicing these types of things. I used to suppress much of my personality and try to fit a “normal” personality. I think my husband finds most of these activities that I do strange and he is an isfp (I’m intj). But thankfully he is an artist so whenever I do something weird he just rolls with it. Know thyself, and if you accept your INJ tendencies, you will be more powerful! I am an INTJ most definitely and unequivocally. Learning that I was an INTJ and all of my accountant friends were ISTJ was mind blowing and eye opening. Everything about our working relationships suddenly made so much more sense. #8 #9 #10 Were the most helpful to me. I think those are things that life and society kind of squelch, and if you’re not careful your long term dreams and goals can begin to seam like works of fiction instead of attainable realities. I am definitely going to be working to improve these. Thank you for sharing. Interestingly I am already the rest of these on my own but I wouldn’t have classified them as exercises, I am not sure I realized I was doing them. #1 I regularly get home from work and just sit in my car in silence, without phone, or music, or anything. It’s so peaceful. I also love to go for walks alone because I can let my mind wander freely as my body is otherwise occupied. #2 Annoys me. I like my boundaries. I am a J after all. But I can imagine what life would be like if I were another person, and if I were them I would have different boundaries than my own… so it works with my Judging part. #3 #4 #5 I’ve been doing since i was quite young without really even considering that it was odd. #6 is so fun. I love going to art galleries or listening to some good angsty emo rock and trying to figure out the meaning behind the lyrics. I love reading people best of all. I may not understand their emotions (because of the ITJ parts) but I can guess their motives and probably will assign a BM type within a few minutes of meeting and talking to someone new. #7 comes naturally, I actually have to work very very hard to shut that off and just accept a story or a conversation at face value. And unfortunately for me when i’m facing relationship conflict and the other person says mean things I can’t shut the N off. I’m always seeing the deeper meaning, reading so far between the lines and getting hurt by my perceptions of their meaning, when all the other person wanted to do was blow off steam. I am learning to replay the words spoken in my head and remind myself to consider them in black and white- letting my mind color between the lines in an argument will get me in trouble every time. I’ve done/been doing/considering doing the things you suggested. A couple of them I haven’t tried, and seem really interesting. I used to write my dream down but it was always difficult because I had to switch modes from inside to outside so I had a hard time. Now that I have a recording device (i.e. my smartphone) I’m gonna reconsider noting them. Dunno if you noticed, but as you record them, you remember them more easily, and also you get more. Last few years (up until this winter), I’d been forcing myself to shut down a lot – but like Sarah earlier said, you can’t shut a Ni dominant down, it would be like stopping thinking (our version of thinking, which is very different as you know). I was also under the misconception – like a lot of other people – that when I was thinking with Ti, I was actually thinking. But I was never too good with that, however I do get by pretty darn well, but not like an ISTJ or INTJ is. I’ve since learned – since I found out my MBTI type actually means – that my thought process has nothing to do with Ti or Te, but Ni and dominant at that. It’s brought me a lot of inner peace and self-assuredness. Again, thank you for your articles, I find them insightful like a few other people’s. #3, #6 and #7 come so naturally to me that I do it multiple times per day without thinking. So much so that I find myself holding back a multitude of questions when people tell me stories, because I found it can be irritating. Maybe I should find time later to write the questions down and explore my thoughts more fully. I have avoided #5 because most of my predictions are on the darker side. I don’t like to be right about negative outcomes, I wish I had more predictions of positive future outcomes.